It’s Friday, folks! And that means it’s time to learn about another Ability. But first, a quick correction from last week’s article about the generational starter Abilities; in my example, I stated that Surf had a base damage of 80, when it’s actually 95. At first, I thought that this was a recent development, but a quick query on Bulbapedia reveals that Surf has always dealt 95 damage, so I don’t know what I was thinking. This week, we’re talking about an Ability that I noticed a lot in my initial play-through of generation four: Intimidate. 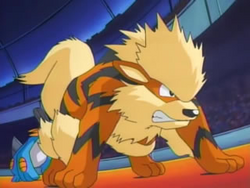 This Ability will reduce the opponent’s Attack stat by one stage when the pokemon with the Ability is sent out, essentially making it a built-in “Growl”. Apart from that, it has a secondary effect from Pokemon Emerald and beyond. When a monster with Intimidate is at the head of your party, wild pokemon encounters will decrease by 50%. Twenty-four monsters can have this Ability, some notable ones being Arcanine, Gyarados, Luxray, Mightyena, and the upcoming Sandile and its evolutions. In this editorialist’s opinion, Intimidate isn’t the most useful Ability in the game, but if you play it right, it can save your neck. Think back to your battle with Lance in HeartGold and SoulSilver. If your main pokemon for that battle was a physical attacker, you found yourself in a bit of a bind, because Lance has two pokemon with Intimidate: Salamence and Gyarados. So if, like me, you were about ten levels below Lance’s pokemon during that fight, having your primary monster two steps below its full attacking power is a tough deficit to work back from. And with a wide variety of pokemon to choose from that have Intimidate as an Ability, this is a strategy that you can emulate yourself. That’s about all I have for you this week! Intimidate’s a pretty straightforward Ability, so maybe next week we’ll get into something with a little more subtlety. Later, folks!